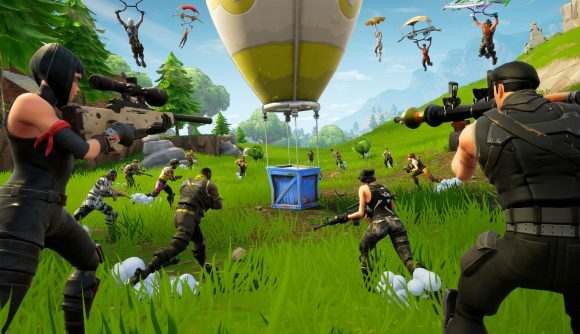 Earlier today, Fortnite players discovered that something new had appeared on the battle royale’s map. A little west of Salty Springs, a little south of Retail Row, and just to the east of the island’s desert biome, an excavation site has shown up – and it’s down to the players to do the digging. As you can see in the tweet towards the bottom of this article, the digsite appears to be full of dirt, much like any of the mines or quarries spread around the map. Upon closer inspection, however, it seems that the whole isn’t full of earth, but of rocks. And while a normal rock might have a few hundred health, each one at the excavation site boasts a total health pool of around 500,000,000. That suggests that we’re looking at a situation similar to that offered by the iceberg that appeared in Happy Hamlets during Fortnite Season 7. That started out with five billion health, but it only took players ten hours to clear it away, revealing an unbreakable bunker similar to the one that used to dwell in Wailing Woods. It’s not clear at the moment how many rocks players will need to clear away, or how deep the excavation site goes. If we’re working around a figure similar to the iceberg from last season, we’d only need ten blocks, but I’d imagine we’re in for a surprise on a bigger scale. Either way, the more important question is what we can expect to find once all the rocks are cleared away. This could be a third bunker, but if so I think it’d be high time for Epic to reveal their grand underground plan to the world. My guess is that the bunkers, once opened, will link up with one another, but it might take a couple of days before we discover what lies beneath. A Reddit thread from earlier today said that at the current rate of digging, players will finish the job on March 30, but as news spreads, it’s possible that the excavation site will be emptied well ahead of time.